Months ago something really clicked in my brain, shook me awake (when I didn't know I'd been sleeping) and shows no signs of slowing down. Maybe it's the endorphins talking. Saturday was the first truly warm day in DC that we've had this year. After coming home from the gym I put on a sundress and walked down my street—standing tall, sun on my face, eating strawberries. Every foot step, every beat of my heart, every swallow said I'm alive, I'm alive, this is what living really feels like. Look I know I sound like a complete douchebag right now but I really don't care. This is where I was when this year first started. I've spent a lot of months confused, over-thinking, and hurt. I invited people into my life who didn't deserve to be a part of it and I suffered patiently because I thought that's what loyalty and compassion looked like. I have a scar on my face now. You can hardly see it when it's covered with make up. When it's not covered with make up it is shiny and red and sits beneath my eye. I can feel it and it yes, sometimes it hurts. I'm changed—but I'm not deformed, I'm not ugly, I'm not broken. So, I'm not angry at the wasted months, I'm not embarrassed that I tossed my heart in the air and nobody caught it—I regret nothing. 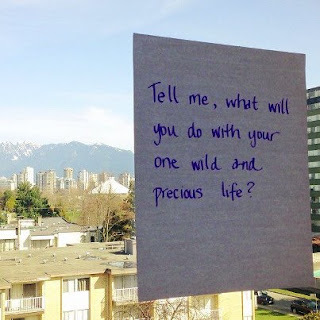 So—tell me, what will you do with your one wild and precious life?